For all of the cool things you can do when you’re working on a Mac in OS X Leopard, you should also know what not to do to avoid problems with your computer. If you need help with your Mac or just want to see the latest Apple tools and products, visit a variety of websites for information. 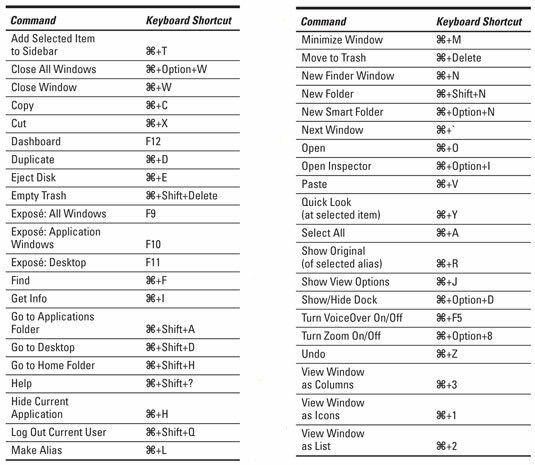 To make the most of your Mac, memorize some keyboard shortcuts. Never clean your monitor with Windex (or another product not designed to be used on video display). And nix on the paper towels and tissues, too — use a soft cloth (microfiber is best) if you want to avoid scratching the display. Never pay attention to anyone who says that Windows is just like the Mac. Yeah, right. And Hyundai is the Asian cousin of BMW. Never bump, drop, shake, wobble, dribble, drop-kick, or play catch with a hard drive (or PowerBook, iBook, MacBook, or MacBook Pro, which contain hard drives) while it’s running. Don’t forget: Your desktop Mac has a hard drive inside it, too. Never shut off your Mac by pulling the plug. Always use the Shut Down command from the Apple menu (or press the Power button and then click the Shut Down button). Never get up from your Mac without saving your work. Just before your behind leaves the chair, your fingers should be pressing Ô+S. Make it a habit. Never keep only one copy of your important documents. Make at least two backup copies and keep one of them in another location. Period. To keep up on the latest Macintosh information including tools, products, and troubleshooting, visit these websites. When you’re finished browsing these sites, you’ll feel like an authority because you know so much about your Mac and OS X Leopard. www.apple.com/support/ — The Apple support site and Knowledge Base are treasure troves of tech notes, software update information, troubleshooting tips, and documentation for most Apple products. www.macintouch.com — This is the preeminent Mac news and information site, full of tips, hints, and troubleshooting information. Many users consider MacInTouch (along with MacSurfer and MacFixit) a must-read every day. www.versiontracker.com — VersionTracker is the place to go to find freeware, shareware, and software updates for Mac OS X. If VersionTracker doesn’t have it, it probably doesn’t exist. www.macminute.com — This site is where those in the know go for up-to-the-minute Mac news — just the facts usually in a single paragraph with a link to more information. www.boblevitus.com — This team of Mac experts is ready to provide you with technical help and training via telephone, e-mail, and/or their unique Internet-enabled remote control software. They (usually) offer same-day service, and prices are reasonable.